I’m a bit conflicted about boxing: I’m not keen on people hitting each other so it feels odd to be putting myself into a position of hitting or being hit. Boxing was first included in the Olympics in 1904 and it’s been part of every Games since then – with the exception of the 1912 Olympics in Stockholm because Sweden had banned the sport at the time. Women’s boxing was introduced at the 2012 Olympics in Sydney. From 2016 male boxers will no longer be required to wear protective headgear in competition, due to a ruling by the AIBA and the IOC that it contributes to greater concussion risk. But female boxers will continue to wear protective headgear because there’s a “lack of data” about its effectiveness on women. 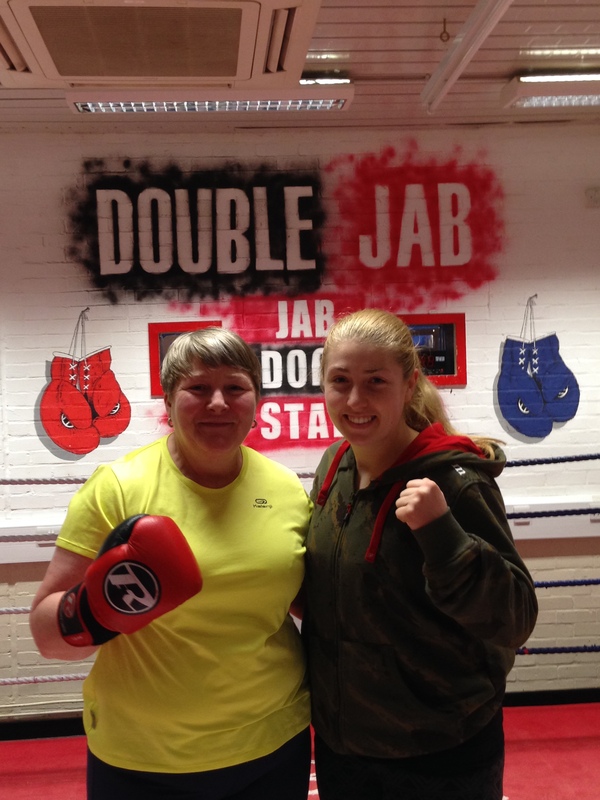 So I was intrigued to find a boxing gym which runs non-contact women-only training sessions. 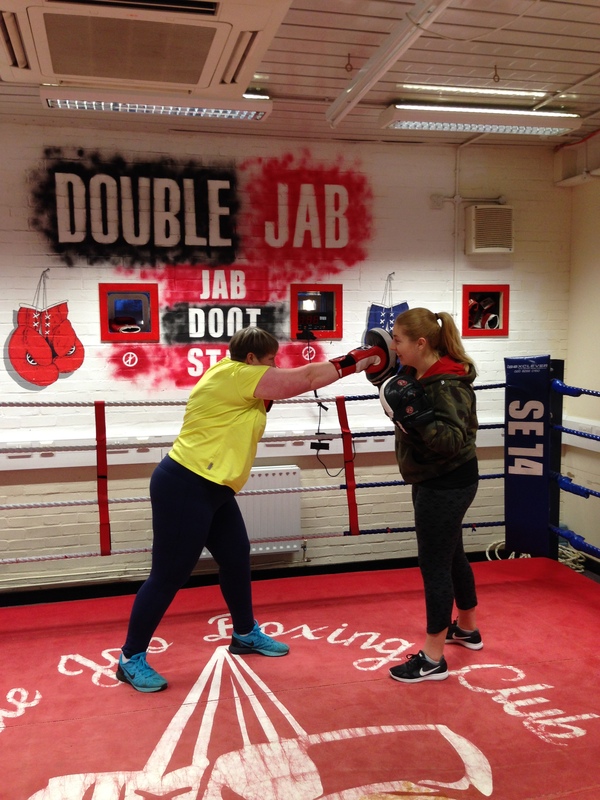 Established in 2012, Double Jab Amateur Boxing Club runs training sessions for young people and adults and places an emphasis on discipline, respect and commitment. This ethos and approach is paying off as the club fields an increasing number of competitive boxers and champions. I managed about 10 turns of the rope. I watched some of the class skip effortlessly, barely hopping from one foot to the other as the rope tapped the floor. My maximum number of skips remained at 10-15 turns. A buzzer sounded to indicate rest periods and, after about 10 minutes, Marnie called for us to hang up our ropes and pull on our gloves. That was just the warm-up. I pulled on a pair of gloves and made a note to bring hand wraps to the next class. Hand wraps will protect your knuckles and they’ll also help make it less unpleasant when you use communal gloves – if you don’t have your own pair of gloves. 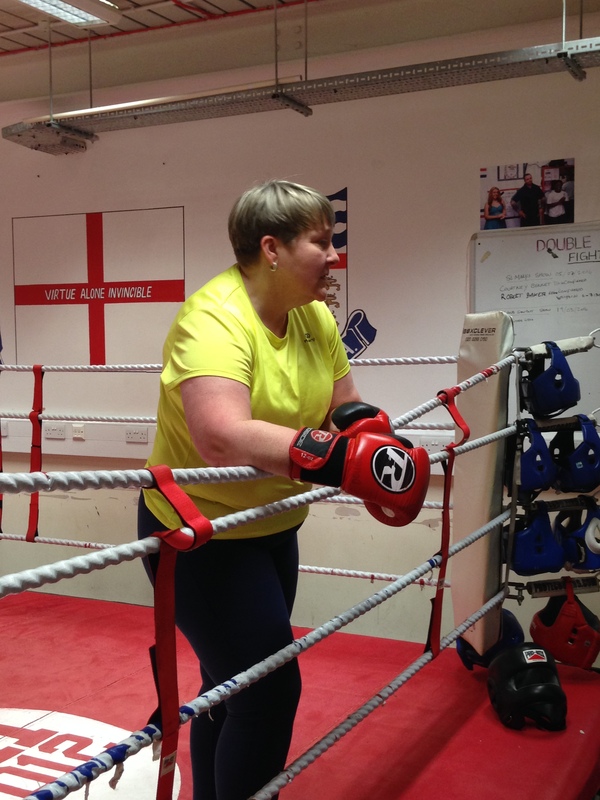 Marnie gave the class a set of drills to complete in pairs while she demonstrated to anyone new to the class how to jab (a quick, straight punch with the lead hand which involves a small rotation of the hips). 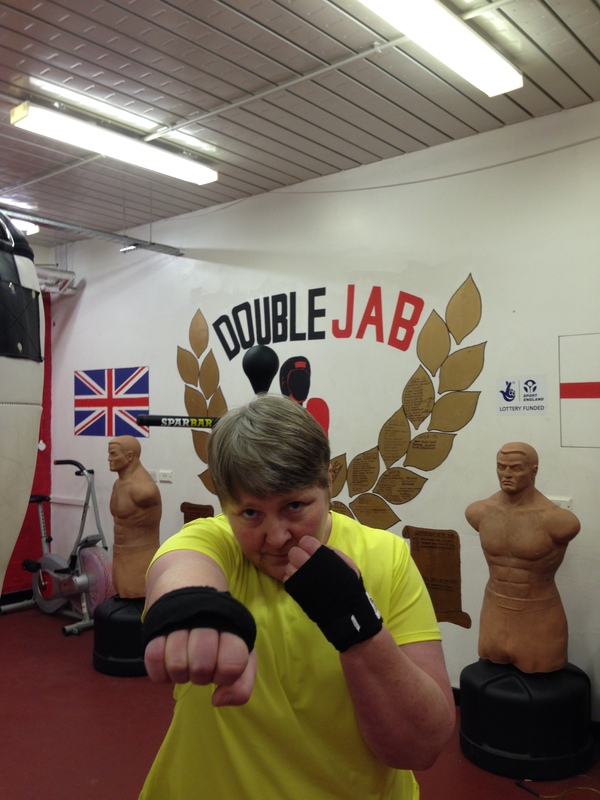 Once she was happy we’d grasped the basics we paired up and started throwing jabs at the punch bags. Between each set of jabs we did sets of press-ups. Next she demonstrated a cross (a straight punch with the rear hand which crosses the body, travelling towards the target in a straight line) and a hook (a semi‐circular punch with the lead hand to the side of an opponent’s head). Watching some of the class land punches on the bags, I was relieved I wouldn’t be stepping into a ring with them. 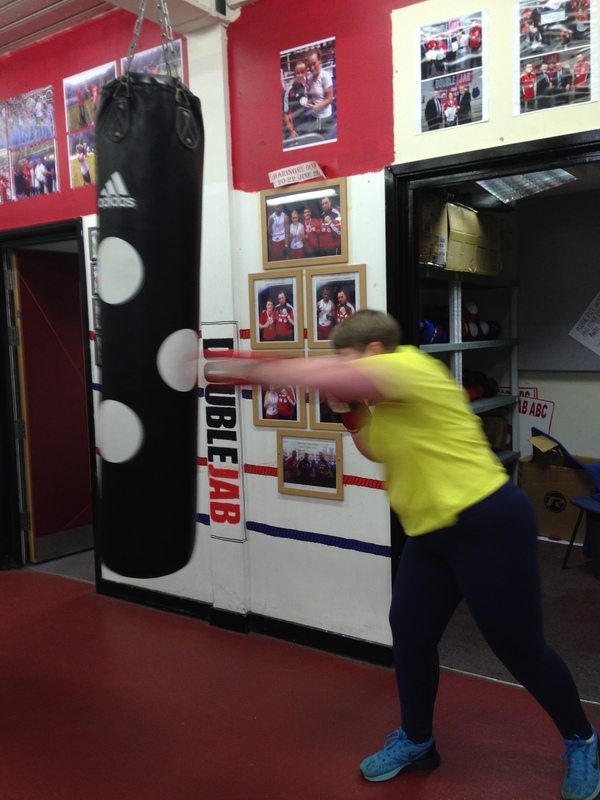 The drills varied: 10 hard punches, 10 fast punches, combinations of high and low punches. 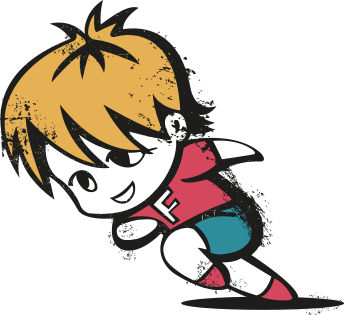 And between each drill we did press-ups, planks, lunges, squats. Time for pad work. I pulled on the pads and, while my partner threw punches into the pads, I moved around the gym, mostly managing to avoid everyone else doing the same thing. Then we swapped and I stumbled around, trying to follow my partner and land punches. 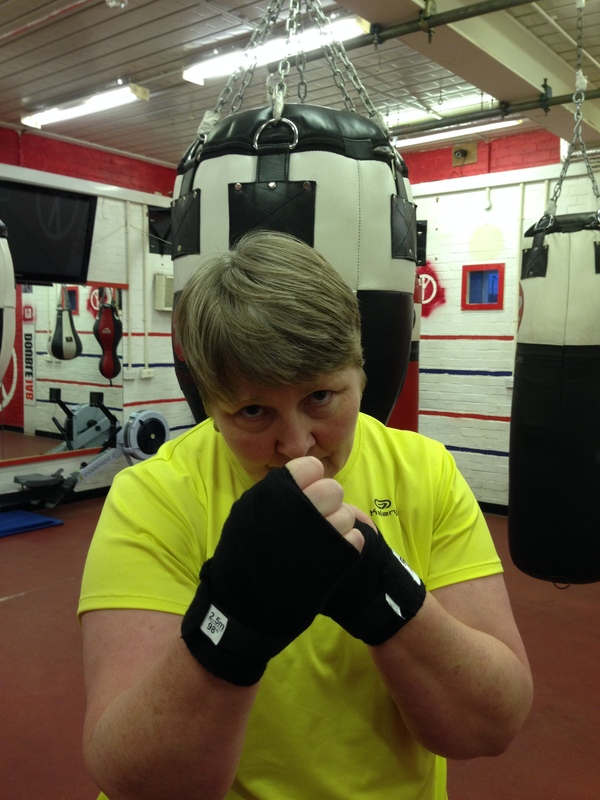 It was more difficult than I’d thought and I wondered where the gloves and pads Trace had used during her kickboxing years might be hiding at home. There was no clock in the gym so I had no idea what time it was and was relieved when Marnie told us to take off the gloves and pads. I grabbed my bag then realised the class hadn’t finished. The last part of the class was circuits, using whatever kit was lying around: medicine balls, kettlebells, plates, tyres, ropes. Even a hammer. Some of the exercises weren’t too bad and others made me feel nauseous. Finally Marnie called a halt and told us to sit on the floor. Some of the class groaned and I wondered why. I soon found out. Marnie told us to stretch out our arms with palms facing down and rotate our arms forwards and backwards in small circles, then turn our palms towards the ceiling and repeat the rotations, then hold our arms stationary for a count of 10. Marnie has a unique approach to counting. It was a fierce workout. Made harder for me because I prefer exercising outside and being inside a gym was a tough adjustment. But I loved it and went back for another six sessions. 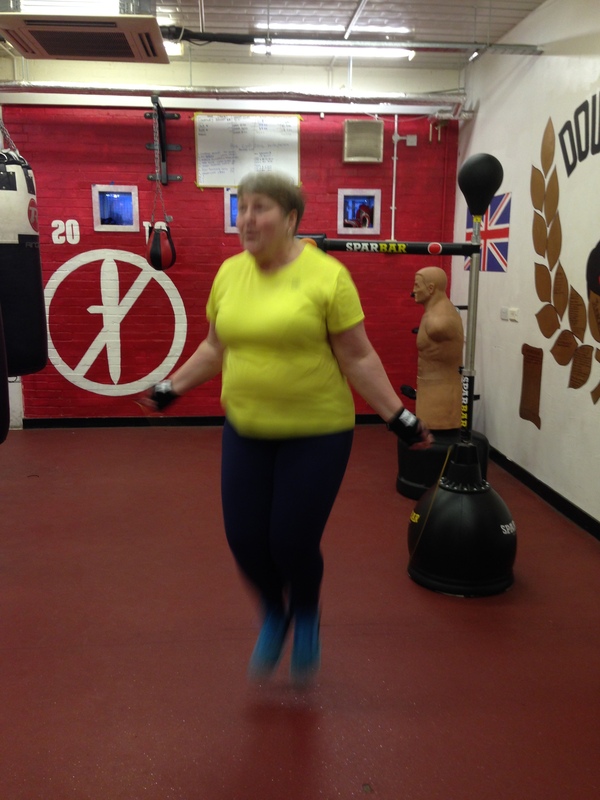 Each class followed a similar format: skipping, bag and pad work, circuits. What changed were the drills. 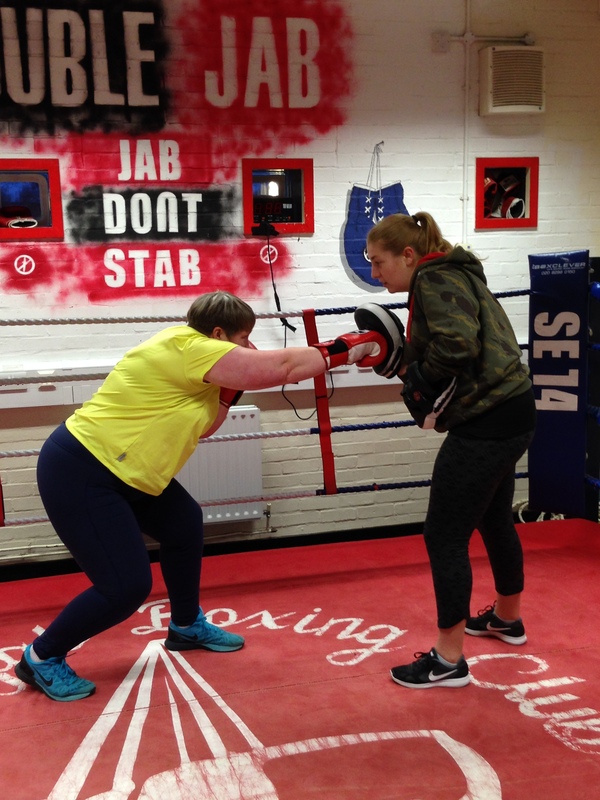 We learned to bob and weave, to throw an uppercut (a vertical, rising punch thrown with the rear hand), to throw a one-two combo (a jab followed by a cross). I’m not ready to spar. Yet. But Marnie keeps checking whether I fancy taking part in an exhibition match. So who knows. And I’ve bought a skipping rope.